Cabbage tops my list as a go-to vegetable for everything from soup to side dishes like kimchee. When the temperature drops, I turn it into a seasonal slaw and dress it up with the power flavors of blue cheese and toasted walnuts. This recipe resembles the type of beet salad served with a Sherry vinaigrette that you see in many restaurants. It’s more tangy and tart than sweet and tart. Bacon makes it craveable. 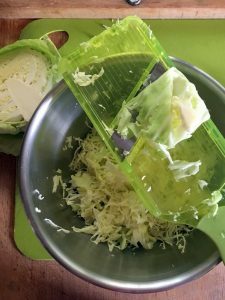 A few tricks to mellow out the cabbage without adding cream or mayonnaise as in a picnic coleslaw. Use nut oil in the vinaigrette to match the flavors in both the blue cheese and the toasted walnuts. Find an imported vinegar made from real sherry wine labeled ‘vinagre de Jerez’. Fine producers age it a minimum of two years in wood to give it a rounded and complex flavor. (If you can’t find it, substitute red wine vinegar with a splash of sherry wine or red vermouth.) Salt the cabbage for a few minutes before adding the dressing to remove any bitterness in the cabbage. Salting tenderizes thicker slices of the chewy green. If you prefer something with that sweet edge, add a tart apple cut into thin matchstick slices. But, if you buy pre-sliced cabbage, which is thicker and more substantial, or you slice it by hand, you may want to calculate one cup of shredded cabbage per serving. I leave that up to you however I do recommend about 1 to 1 ½ Tablespoons of dressing per cup of shredded cabbage. 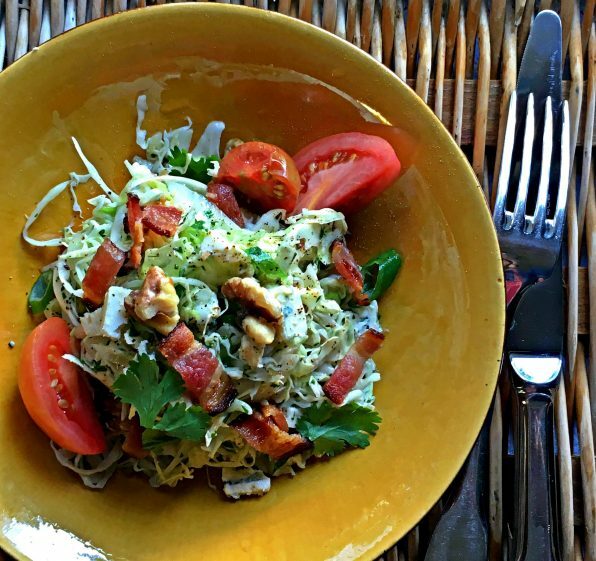 This recipe makes more than enough salad dressing. To prevent it from wilting, dress your cabbage to order The dressing keeps for a couple of weeks in the refrigerator so you can make the finished salad in several small batches. Serve this winter cabbage slaw on its own as a first course before a substantial meal. Wouldn’t it be spectacular served in the hollow of a roasted acorn squash? Or as an accompaniment for smoked trout. Salt the cabbage for a few minutes before adding the dressing. This helps remove any bitterness in the cabbage. It also tenderizes thicker slices of the chewy green. Although I use green head cabbage, Savoy cabbage would work well too. If you cant find sherry wine vinegar, substitute red wine vinegar with a splash of sherry wine or red vermouth. For the dressing, combine the vinegar, chopped shallots, salt and pepper in a blender on high speed. Add the oil and blend a minute or two until the dressing emulsifies. To help keep the dressing from separating, add 1 Tablespoon of hot water and blend for another few seconds. Or whisk it together right before using. To prepare the salad, toss the shredded cabbage with a generous pinch of kosher salt. Add the diced scallions, blue cheese and parsley. Dress the cabbage with approximately 1 to 1 ½ Tablespoons of dressing per cup of shredded cabbage. Taste and add more salt and pepper if needed. Divide the salad among 4 serving bowls. Sprinkle with the walnut pieces and bacon. Additions: Peel and core a tart apple. Cut it into thin matchstick slices and add to the shredded cabbage. Dice a mini cucumber and add to the cabbage. Goji berries, tart and nutty would be great in this salad.